As part of London Fashion Week 2012, Parsons The New School for Design will represent the U.S. Embassy in London through a showcase of work by the first graduating class of students from the MFA Fashion Design and Society program, a highly selective program for emerging designers that was initiated through the support of alumna Donna Karan. 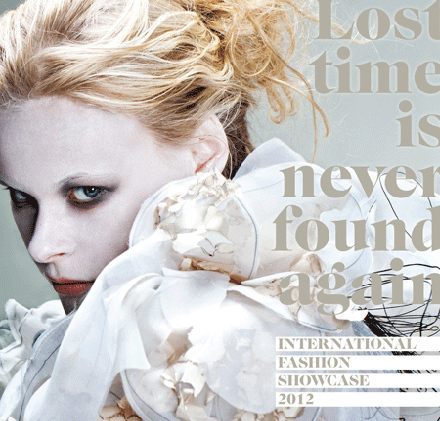 The exhibition, Lost Time is Never Found Again, is part of the first International Fashion Showcase, sponsored by the British Council and British Fashion Council (BFC). BFC Ambassador for Emerging Talent Sarah Mower will chair an advisory panel that will judge each piece of work, with an award given to the country that presents the best emerging fashion talent showcase. It is an honor for us to be representing the United States in this inaugural event, and to be able to share with an international audience the work of our talented students,, said Shelley Fox, the Donna Karan Professor of Fashion at Parsons, who directs the MFA program. Among the work on view will be award-winning looks from recent competitions held by the Metropolitan Museum of Art Costume Institute in conjunction with Alexander McQueen: Savage Beauty, and also Pitti Immagine Filati, the premier Italian knitwear industry event. The exhibition is curated by Tony Charalambous, a London-based curator and artistic director. The exhibition will be on view February 15’20, 11 am ‘5 pm daily, with tours on February 19th at 11:30 am and 12:30 pm. The showcase is being held at the Benjamin Franklin House, 36 Craven Street, London. The International Fashion Showcase invites the public and international press and buyers to explore work by the world’s most innovative young designers during London Fashion Week 2012. For the event, 19 embassies and cultural institutes throughout London, including those of Australia, Belgium, Botswana, China, Estonia, Italy, Jamaica, Japan, Korea, Nigeria and the United States, host exhibitions of work by their nation’s best emerging fashion designers. For more information, visit the British Fashion Council website. The MFA in Fashion Design and Society at Parsons is an advanced degree for talented, emerging fashion designers. The program is studio-based and fosters experimentation, providing students with the design and research skills they need to become successful in the field, including a critical awareness for self-development and growth. Program director Shelley Fox is an award-winning designer who has created numerous experimental and innovative womenswear collections that have been exhibited in the U.S. and internationally. For more information, visit www.newschool.edu/mfafds.